Today was an all scarf day. 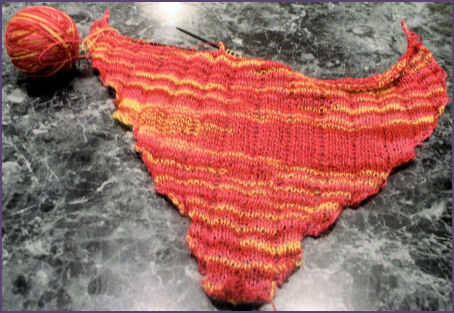 I’ve been working hard on my Clapotis made from a single strand of KnitPicks Shimmer, because frankly, I’d like to get moving past the increase section. I’ve been working on it steadily for nearly two months and it’s still not wide enough for the summer shawl I want to make. But I measured it this morning and it’s finally getting close. 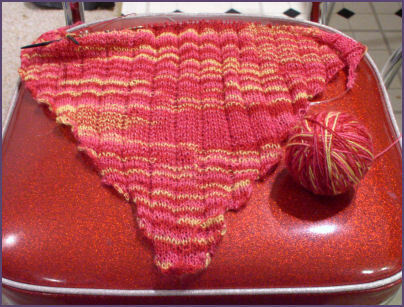 Of course, it was probably a bit of a dumb idea to make this particular pattern out of a laceweight yarn, but then again, I would suppose that ANY shawl made with laceweight would have thousands and thousands of stitches. So, either way, I should have guessed that this one would take a while. Why oh why do I have to be the slowest knitter in the world? There are so many things I’d really like to move on and do. I’m getting excited about trying log cabin knitting as described in the Mason Dixon Knits book. I literally have a whole tub of purple yarns that I think might look good all put together in an afghan. I knew I’d been saving them for something! My coworker gave them to me some time ago by now and I was never quite sure what to do with them but then I saw this book and it came to me. How cool! Yay! 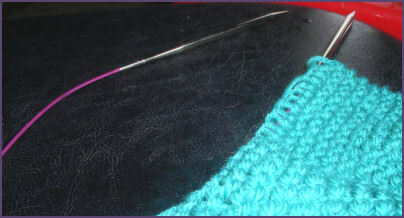 Diana is knitting again! She’s been watching my Thursday night knitting buddy and I as we sit under the canopy at the pool and knit the evening away. I think she’s been impressed by Rhoda’s projects and the fact that Rhoda actually completes things (whereas I have total kntter’s ADD and a finished object is a rarity for me! ), and that has inspired Diana to pick up her knitting again. She was brave to try kntting two strands together for a first project, as it turns out that this particular yarn is fussy to work with and gets knotted up on itself very easily and is also prone to splitting. (I don’t remember what it is anymore, and Diana discarded the ball bands long ago.) I think it looks great for a very first project, fairly neat but just irregular enough to give it an artsy feel. Also, Genia, the lady who taught Diana to knit told her that mistkes are just artistic little places to add funky buttons, and she definitely wants to do this with her scarf. It surely will give the scarf that extra edge of personality. And she already can’t wait to wear it to school this fall, to show her friends. Maybe she’ll spark an interest in knitting. I hope she sticks with it this time, but I have new hope because it grew more in one day today than it has the whole time she’s been working on it. 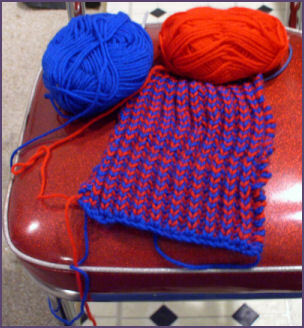 And Diana thought I should be sure to include a picture of the scarf I’m making for Steven, which is red and blue, at his request, in honor of his two favorite engines–Thomas and James, of course! I’m knitting it in Brioche stitch, which is sturdy and warm, and alternating colors every two rows so I can carry the yarn along and not have to weave in a bunch of ends when I’m done. Back to the Thursday Night Knit for a sec… I just want to say that I am really loving getting to know Rhoda, and really loving having someone to knit with! And she always has fun things to share and show! This week she brought a finished Booga Bag, made mostly from Cascade 220 with a center band of coordinating Noro Kureyon. I never would have thought of doing it that way but it sure did turn out cute. The Best surprise of all was that Rhoda brought a copy of The Principles of Knitting, which she was able to borrow from the libary where she volunteers. Wow! I have heard so much about this book over the years but have never actually seen one. Current prices on Amazon used books are $244 and up! I understand that this book is really sought after, but I can’t imagine that anyone would ever actually pay that much! But it is very big, and full of information. I have lots of reading to do this week! Thanks, Rhoda!! The fit is very comfortable and she did a great job of guessing my size. I can tell that when winter comes I am going to get lots of use out of these! I will have no excuse for cold feet any longer. Thanks, Michele!! You’re the best! This past fall I helped Michele as she learned to knit. I introduced her to the craft and she took to it quickly and has already made many beautiful things. I’m glad that knitting has renewed her interest in crocheting and expanded her interest in trying other wonderful crafts. Most of all, I love having the occasion to be a beneficiary of her efforts!! 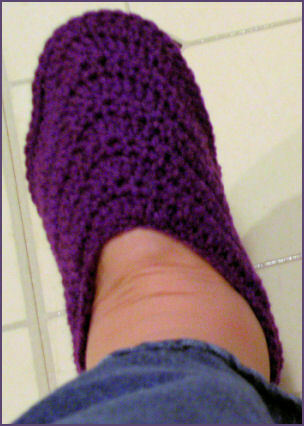 <smile> These purple slippers did make my day yesterday. Yesterday when we got home from work, we discovered that my birthday gift from DH and kids finally arrived! Yes, I’m on the KnitPicks Options Bandwagon! The kit contains needles in sizes 4 to 11, with other sizes available. I haven’t knit with them yet, but can’t wait to start. Here’s a photo of the snazzy needle case. 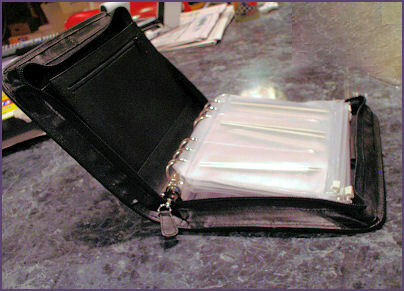 Here’s a shot of the case laying open, with the needle pouches visible. Of course I had to go and order the needle sizer immediately, because I took all of the needles off their shipping card so quickly that I may have mixed them up! Perhaps it is my only complaint so far that the needles are not marked in any way. Here’s a pic of the needle tips. I do love them though some people have complained that the neelde tips can feel a bit sharp. I think I’m going to like them; they fit well in my hand. 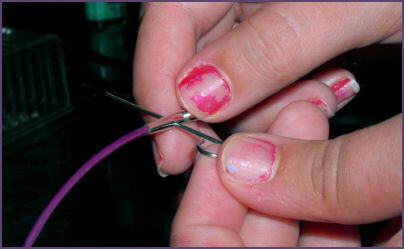 Here Diana demonstrates inserting the tightening key when putting the needles together. She needs a manicure! I can see myself losing the “key” because it is tiny but it is about the width of a sturdy paper clip. Notice of course that the cables are purple!! Seriously, I can’t wait to knit with these babies. They are so light and fit so nicely in my hand. I can only hope that they’ll work as nicely as I think they will. Yay! Does it look bigger yet? I was surely hoping it would, as I have been knitting away at this thing, hoping it would eventually grow up to be a shawl. I think I still must be months out from completion. What’s a girl to do? Given that I have such “Knitting ADD,” I wonder if this project ever will see completion, or whether it will just land on my ever-growing pile of UFOs. I need to start a UFO gallery! It would be WAY bigger than my Finished Objects Gallery. But I do have a couple of things to add to the FO gallery, in fairness to myself. I just noticed that the other day. Nothing major, mind you, but at least one scarf and some hats. Whoop-dee-doo. So, I’m sitting here praying that it doesn’t rain tomorrow. Yeah, right. They’ve been predicting it all week, but I can hope, can’t I? Thursday night is knit night at the pool and last week was the first time anyone ever joined me. And then, tomorrow, if I’m lucky, a couple other people will join me, too! 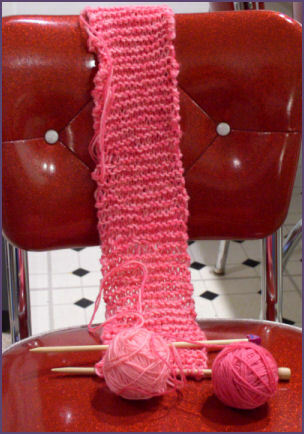 How cool would that be, to spend a glorious evening knitting with friends? Cross your fingers with me that we don’t get thunderstorms and that the humidity stays low. Yeah, right. It’s July in DC. Don’t put your money on it! I’m turning 41 on Friday! Going out with the “gal” cousins to a Japanese steak house. I wasn’t looking forward to my birthday before this, really. This year is my mom’s year for the “milestone” birthday (hers is the day before mine) so we’re celebrating hers in a big way on Saturday and while I’m glad for that, I’m also glad that because of it we weren’t doing much for me. Last year at my big “40” celebration was the last time I ever saw my dad looking half well, and on his own two feet. Things went downhill fast after that. So last year was a great time, but also bittersweet. So, I’m glad the cousins are going out. All women, no kids, no distractions. Yay! Sounds like it’s going to be a good birthday after all. Well, I finally got the chance to knit with a friend at the swim club tonight. I met Rhoda, from the KnitTalk group, and she is lovely! We had a grand time chatting and knitting. She brought some goodies for me to ooh and ah over, and I was thrilled! First were the KnitPicks Options Needles, and Oh, I think I am in love! The needles are as light as air! I don’t know what that says about their long term durability, but ooooh they feel so good in my hands. The cable is so thin and so flexible, (and purple. to boot!) and once Rhoda showed me the proper technique for using the tightening tool, I found them very easy to assemble. The needles are on my birthday wish list, and I do hope to receive them. 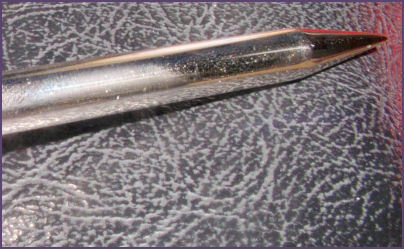 This is a pic of the Options needle tip. It’s very pointy! Which can be a good thing or a bad thing, depending on what and how you knit. And I do find that the barrel of the needle fits just right in my hand. Did I mention that the cable is purple? Haha. It’s my favorite color. Yes, I will still love my Denise needles, but these are definitely going to be an asset to the collection. 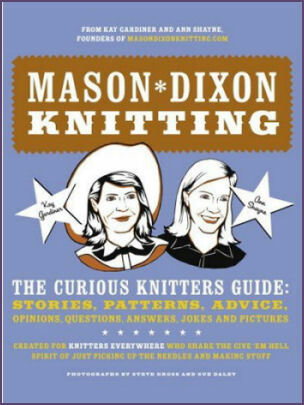 Rhoda also brought the book, Mason-Dixon Knitting : The Curious Knitters’ Guide: Stories, Patterns, Advice, Opinions, Questions, Answers, Jokes, and Pictures. 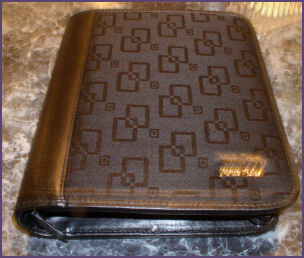 Wow, I have wanted this one for a while, and I think I am going to move it up higher on the wish list. The discloth patterns seemed like something I’d actually make, whereas before now, they seemed like a boring project and didn’t really interest me at all. But the ones in this book were nice! the nested felted baskets were nice, too, and the afghan patterns were quite unique. Plus it looks like there’s plenty of reading too, to make the book colorful and interesting. Hmmm… I’m kinda on a book moratorium at the moment, since I have so many, but I think this would be the next one on my list. All in all I had such a fun evening knitting and getting to know a new friend. The weather was gorgeous too, which is nice after weeks of rain. They say we shouldn’t see any more rain at least through the weekend. That’s a relief. I know, it’s been a while. But the truth is, when you’re just knitting away on the same thing ad nauseum, it’s hard to find new and exciting things to say! So that’s the reason for my long absence this time, but I’ll try my best. 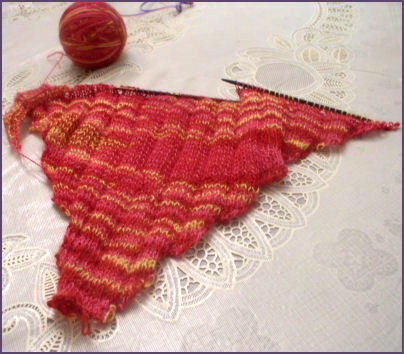 As I suspected, it’s taking a while to knit this version of the Clapotis, given that I am using KnitPicks Shimmer, which I’ve decided is about as thick as dental floss. I’ve never worked with laceweight yarn before, and this has been quite an experience for me! I must have started over at least a dozen times, only to get myself tangled up in the first few little stitches, and have to start again. I was about to give up for good, when after about two weeks of trying it finally came together. Still, it has taken me a month to get only this far, not nearly finished with the increase section. Of course, even with this thin yarn, I was shooting for the shawl size. It’ll be forever, but that’s ok.
On a technical note, I’ve been getting my feet wet with Dreamweaver again and I think this time I’m getting the hang of it! Today I learned how to make and use Dreamweaver templates, which should make updating this blog a bit easier. Consistent with the idea of making a shawl sized Clapotis from the thinnest possible yarn, I also do my blog the hard way. I don’t use any of the blogging software that’s out there, and instead do my own thing with a web site. But it has made it hard to make site-wide changes until now. Now, all I need to do is make simple changes to the Dreamweaver template file and they will be easily applied site wide. At least that’s what they say. Of course, as I am writing this we’ve had a big storm come through and the cable’s out. So no telling when I’ll actually be able to upload! !